I have been a record collector since I was 12. pianosolo is a clear example of the inadequacy of records. The problem is that I recently saw Antonello Salis perform at the Umbria Jazz festival in Perugia, Italy. Salis is from a small village in Sardinia, does not read music, and uses the piano as one means to communicate his musical fantasies, his maniacal energy and his ecstatic celebration of imaginative freedom. In person, Salis might splatter and crash across the keyboard, or slash the piano strings with a drumstick, or leap up to wheeze and shriek on accordion, or massage a plastic bag over a microphone, or gargle water, or even play ringing chords and piquant piano melodies. 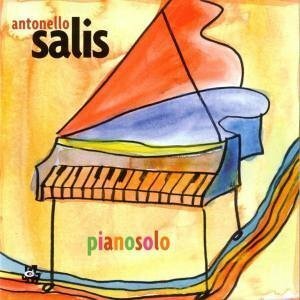 pianosolo conveys only a small percentage of this excitement, but it reveals how Salis’ instrument sounds like no other, in his blinding runs of crushed right hand notes that congeal in intervallic overlays and clang joyously or ominously like wedding or funeral bells. Nino Rota’s “La Dolce Vita,” in six minutes, is a vast fractured symphony. So, of course, is “Salismaninoff.” “Nightmare N. 20” turns lyricism into the trills and tremolos of madness, with Salis’ creative impulses unleashed to run wild. Records are inadequate, but Italy is far away, and pianosolo is still a kick.